Our brand new bespoke Online Parts Shopping Cart has been launched…! FOC carriage offered for all parts stock orders until 31st May 2019. Add a list of parts to our quick order form. See our live stock availability for each item within the cart-you can also check stock direct from our website on various pages. See RRP’s, discount & your NET prices for each item. Delivery direct to your customer option, under plain wrapper with all paperwork sent to yourself. Send what you have in stock option, with backorders to follow carriage free. All orders placed will be saved for your future reference. Receive email confirmation for all orders placed. 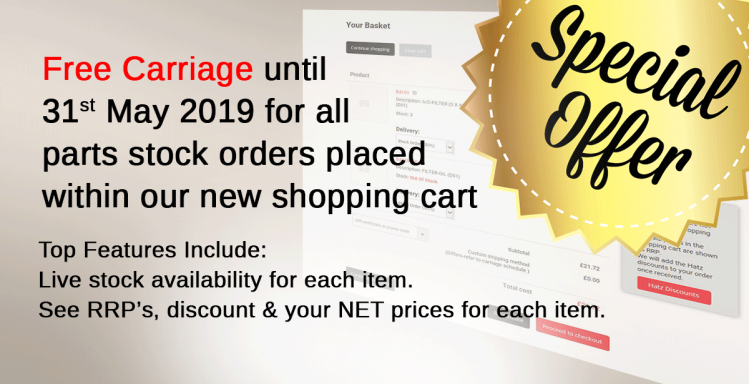 Send us a message relating to each order direct from the cart. Carriage & supplier charges are currently added by ourselves following receipt of each order-refer to carriage/supplier charges & ETA's file for full details. Hatz parts prices are currently shown as full retail - refer to Hatz discount schedule for discount which will be added by ourselves prior to dispatch. Refer to part number & prefix file for correct entry of items - the cart or stock check will not recognise items entered incorrectly. Contact us for emergency direct/warranty & engine/transmission orders-the cart is currently for parts only. Multiple branch users: Each branch must have a unique email username for the account login to ensure orders are sent to the correct address. Usernames are pre-set to the order contact email we currently have on file. Passwords are pre-set to your account number with us, but can be amended to a password of your choice by using the forgot password link. If you are unable to gain access to the cart, please complete the Login Details Request Form.